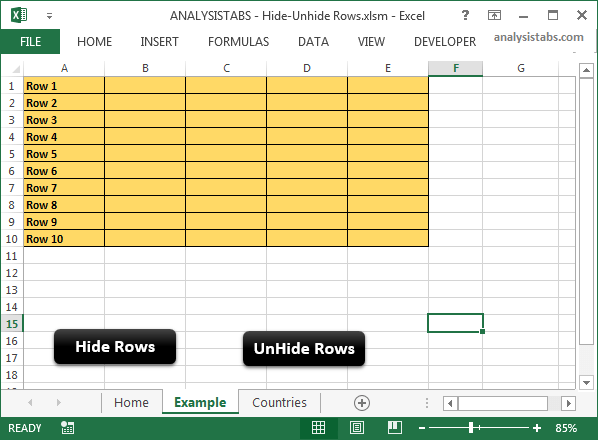 Hide UnHide Rows in Excel Worksheet using VBA - Examples and Codes -Learn Excel, VBA, SQL, SAS and Data Analysis - ANALYSISTABS! You can use EntireRow.Hidden property of Row. If you set hidden property TRUE, it will hide the rows. Or if you set it to FALSE then it will make rows to visible. 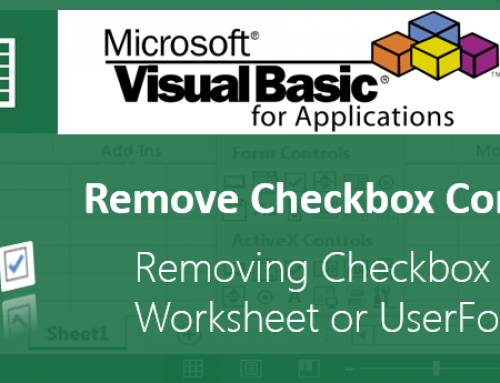 The following example will show you how to Hide and Unhide the rows in excel worksheet using VBA. We can Hide or Unhide the multiple rows at a time. In this example I am hiding and Unhiding Rows 5 to 8. Here is the example screen-shot. You can download the file below and see the code. Hide button will call the procedure to hide the rows and unhide button will unhide the rows. 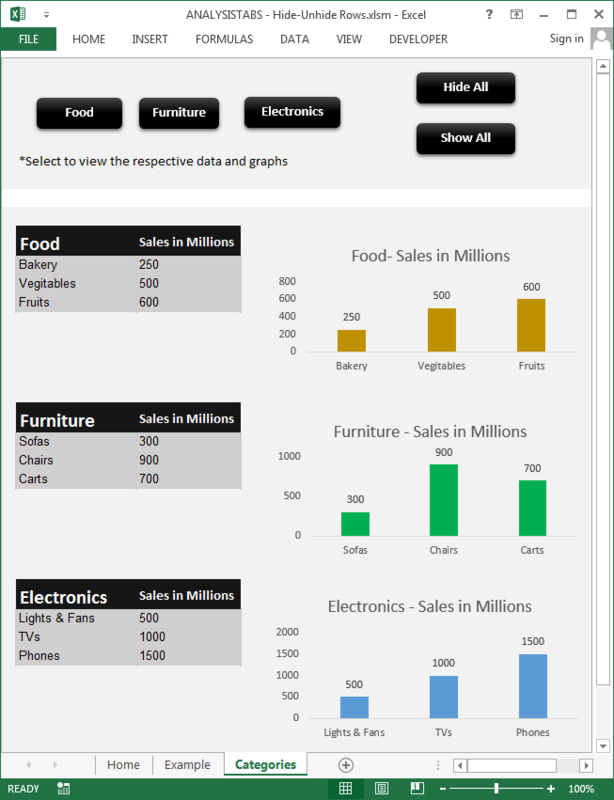 For example, Food Button will show you the data and charts related to food. And ‘Show All’ button will show you all categories and ‘Hide All’ button will hide all categories. 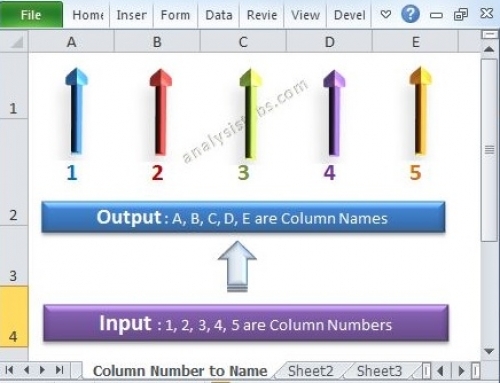 The following example will hide all all rows with the text data /strings in Column A. The following example will hide all all rows with the values as 0 in Column A. The following example will hide all all rows with the negative values in Column A. The following example will hide all all rows with the Positive values in Column A. The following example will hide all all rows with the Even Number in Column A. 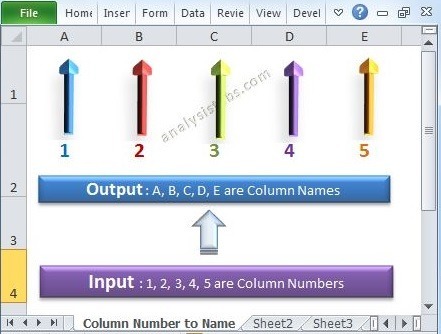 The following example will hide all all rows with the Odd Number in Column A. The following example will hide all all rows if the value in Column A is greater than 50. 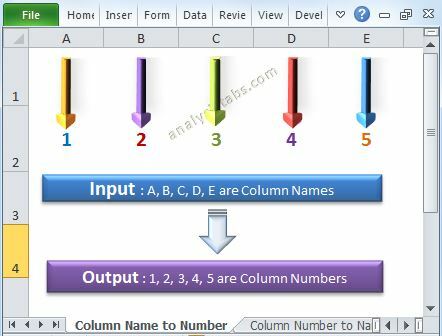 The following example will hide all all rows if the value in Column A is less than 100. In case I want to hide a row with condition…… for eg. I have a data base with some columns having text and some having numbers. If value in one of the columns becomes 0 or a negative number or a text then that row should get hidden. 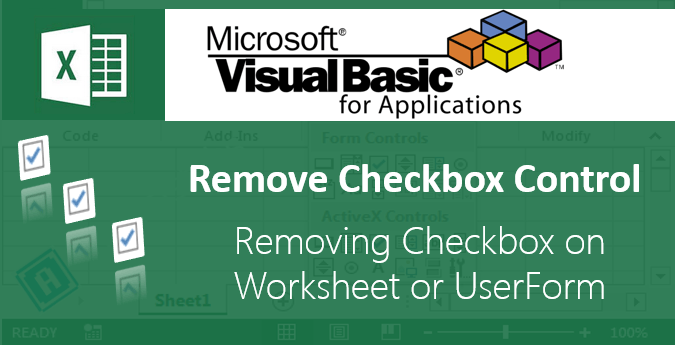 could you please automate such a task in excel ? I have updated the post with number of examples with criteria. I tried to apply the same principle to columns with the conditions in row 1, but it can’t run. My desire is to specific cells. I have checkboxes and command buttons sprinkled throughout the worksheet. What I like to do is to hide the cells containing these form types. Maybe I have to redesign my worksheet to have all these buttons and boxes either all in a row or a column and hide the row/column. Have not had much luck with this. Can you help please? thank you for this very usefull topic. I have a “Input” sheet which is linked (Via Vlookups in C:C) to 8-10 other worksheets (containing rates of materials). On a daily basis I have to insert the quantities (in Column D:D) next to the rates in the “Input” Sheet to multiply it with the corresponding rates to arrive at the total amount (in Column E:E) eventually. The issue is I have to hide the materials (Entire Rows) I do not use in the Input sheet as well as the other reference sheets. Is there any way a macro can be written to help me? Thanks for the great poste it really helped me, how would i loop this macro round to unhide the hidden rows when the box is unchecked? I have a worksheet with live data of stock value, high, low in Column A3:A103, B3:B103, C3:C103 respectively and other formula in other columns and that updates every few seconds. I would like to see only rows where below conditions is fulfilled and hide all other rows to filter out stocks. Above condition is for example of Raw No.3 and which I am using for conditional formatting. 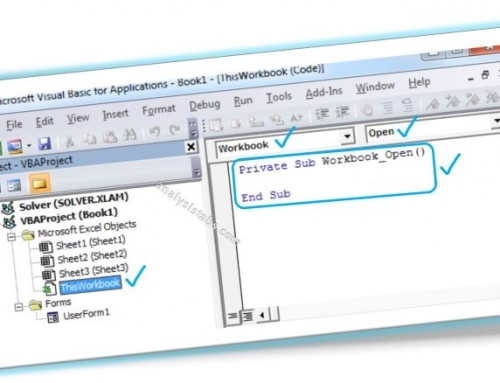 Kindly help to provide VBA codes for this. How would someone show/hide rows in a 2nd range based upon the visibility of rows in a filtered range? For example, if rows 5 through 20 are autofiltered by some criteria such that at a given state only rows 6, 8. 12. and 16 through 18 are visible, how could someone then show the matching rows in the range of rows from 105 through 120, so that along with rows 6, 8. 12. and 16 through 18 being visible by filtering; rows 106, 108, 112, 116, 117, and 118 are visible, while rows 105, 107, 109, 110, 11, 113, 114, 115, 119, and 120 are hidden? How can this be triggered by the setting and resetting of the autofilter on the filtered range?